It's easy to learn how to make a money tree for a party, so you can give a memorable gift for any occasion. Although it would be nice if money grew on trees, money trees are a craft project rather than a horticultural experiment. 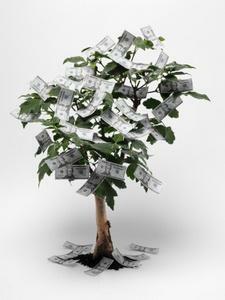 To make a money tree, you cover a tree or branch with bills, usually folded in an attractive manner. You can attach the money by tying or clipping the bills. There are two ways that money trees typically come to life. Some start out bare and all of the guests at a party are asked to add bills to its branches. Other money trees are gifts from a single guest or group of guests and are presented at the celebration fully formed. For individual givers, a money tree is all about the presentation. If you are planning to give someone $50 as a graduation gift, you could purchase a gift card, write a check, or slip a fifty-dollar bill in a card. However, a tree covered in leaves made of 50 one-dollar bills will be a much more interesting gift. Trees that are created at a party focus more on the collaboration between guests to provide a more substantial gift as a group than they could present on their own. Purchase a real or fake potted tree or find a suitable branch from a real tree. However, if you are using a branch from a tree in your backyard or the woods, don't take it inside immediately. Leave it in a garage or another sheltered place to dry out and to give bugs a chance to leave the wood. You should also wipe down or wash the branch to remove any dirt and debris. If you are using a branch, you will need to secure it in a pot. Depending on its weight, you may need to use floral foam, clay or plaster. Make sure the plant is in an attractive basket or pot. It will be a focal point of the event, so it should add to the party decorations. You can add ribbons, lights, tulle or other accents to help it match the theme of the event. Fold the dollar bills in an accordion fashion. One-quarter inch folds are typical. You can use any denomination. However, using smaller bills tends to result in more bills for the tree, which will result in a fuller tree. Tie the folded bill around the middle with floral wire, ribbon or thread and secure to a branch. Alternately, purchase clips and use those to attach bills to the branches. When deciding the size of the tree for a money trees to which all guests contribute, you need to consider the size of your party and where you will be placing the tree. A large reception will quickly fill a small tree and conversely, you don't want the smaller amount of contributions at a more intimate gathering to look puny on large branches. You will want a smaller tree if you are going to display it on top of a gift table instead of placing it on the floor. Choose your invitation wording carefully if you want to inform guests of a money tree. Although it has become fairly common for events like weddings, some guests think that specifically asking for money as a gift is tacky. Keep an eye on the money tree throughout the party, especially if you host the event at a facility, such as a banquet hall, where other celebrations are going on. Finally, make sure the recipient has a way to get the tree home after the party, especially if it's a large one. Once you've learned how to make a money tree for a party, an attention-getting gift will always be at your fingertips.